Eight months after Sarah Palin’s acceptance speech at the Republican Party National Convention in Minneapolis-St. Paul, Minnesota, Americans were given another revealing glimpse into the philosophy shaping our nation’s culture. This was the question asked of Carrie Prejean, representing the state of California in the Miss USA pageant. The question was asked by openly gay pageant judge Perez Hilton as a part of the Miss USA selection process. While for many of us it may be difficult to imagine a more respectful, defensive, kind and even sheepish defense of the actual institution of marriage than that which Miss Prejean offered, the simple fact that she affirmed a personal belief, when asked, that marriage was to be “between a man and a woman”, was enough for impartial, unbiased, politically and religiously neutral judge Perez Hilton to come completely unglued. As a result of honestly answering the question put to her in an excruciatingly polite manner consistent with the well-reasoned and time-tested beliefs of the overwhelming majority of American citizens since the founding of the republic, Carrie Prejean was denied the Miss USA crown and Perez Hilton went into full blown offended drama queen mode. Throughout this incident and the firestorm of controversy that followed, Carrie Prejean’s position was painted as suspiciously defensive in most Statist media presentations, while the Perez Hilton position was generally treated as normative and therefore worthy of less scrutiny or criticism than Miss Prejean’s. Why is this so? The answer to this question as well as many related issues swirling about the perpetual conspiracy to assassinate Sarah Palin are found in the very nature and identity of the counter-Christian culture in which we live. In an America teetering on the brink of a shift from post-Christian to anti-Christian state, the Secular Inquisition has begun. While Carrie Prejean’s tepid, defensive, limp-wristed (and she didn’t even get points for that), ever-so polite response to Perez Hilton’s question did indeed cost her the title of Miss USA, it also managed to reap a wealth of useful information. However flamboyant a representative of contemporary American leftism Mr. Hilton may be, his views are largely representative of the hyper-relativistic brand of secular humanism that currently dictates the course and rate of decline for our culture. Sadly, Hilton’s is the favored position, at least from the perspective of the secular forces driving our nation. This makes the Prejean/Hilton exchange worthy of further consideration. Biblically submissive Christians cannot represent America. “All of America” includes ridiculous living caricatures of homosexuality; it does not include biblically submissive Christians. Biblically submissive Christians can be excluded in the name of inclusiveness. Put another way, alienating Christians is perfectly acceptable for the simple reason that they are perceived to alienate others. Political expression is reserved exclusively for those expressing politically correct views. Religious expressions, if they must be made at all, are allowed only insofar as they conform completely to anti-Christian standards, thus rendering the Christian silent. Political and religious questions, when asked of a Christian by an anti-Christian, cannot be answered honestly or accurately, as the Christian response must universally conform to anti-Christian standards and is therefore impossible. In this light, anti-Christians really do not ask Christians questions at all – they merely use a question format to inform the Christian of truth from and anti-Christian perspective. It’s kind of like a satanic twist on Jeopardy! Expressing an anti-Christian opinion in the promotion of tolerance, acceptance and unity is a natural and good thing, while expressing a Christian opinion on the same matter is almost always an open violation of goodness and decency at every level. Perez and Paris Hilton are of roughly equal value to western civilization. There are many more useful points that could be listed, to be sure, but the true nature of the new American thought police is revealed clearly enough by these alone. In a nutshell: Bible believing Christians are, by definition, wrong and must be silent. 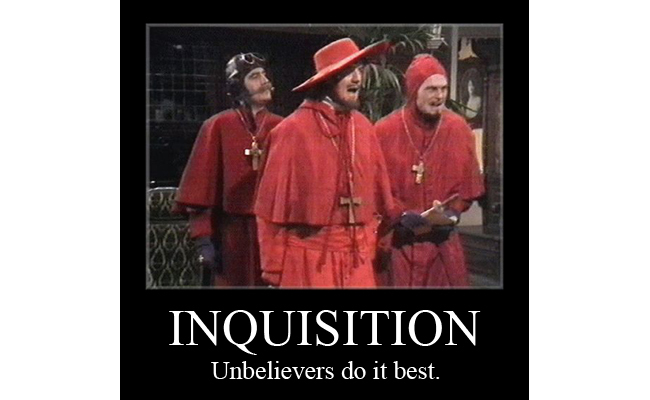 This is the guiding principle of the Secular Inquisition. This movement has been underway in America for some time now. It continues to gather steam, having moved beyond its base of Statist media support and into the deeper fabric of the culture, primarily through the public education system. Its goal is, for now, the silence and suppression of Christian thought. As such, every Common Believer is a threat and legitimate target of the Secular Inquisition. Any public expression of distinctly Christian thought must be met. It must be countered. It must be crushed. And soon, it must be banned. What will this Conservative wing of the Secular Inquisition do to distract and confuse the professing Christians who find its practical, pragmatic appeals so very tempting? More concessions to the “inevitability” of Socialism in practice as massive State-empowering programs like Social Security, Medicare, and the State-controlled “education” of children are piled higher and higher in the “untouchable” category? More lectures and conventions and candidates proclaiming the Party Line of “how things work in the real world” while assuring us all that to actually apply God’s perfect Word in that “real world” is pure foolishness and nothing short of impossible – a foundational view that is in perfect harmony with their Liberal Inquisitor counterparts, of course? Yes, yes, and yes again. This is definitely what we will get from here on out from Christ-dismissing “conservatives”, just as we have gotten it from them at every turn along the way to our dark and deteriorating present. The Secular Inquisition – both its Liberal and Conservative wings, will constantly strive to paint those who dare stand for the Word in application here and now as everything from “unloving”, “unkind”, and “unreasonable” to “fanatical”, “obsessed”, and, ultimately insane. And at the end of this road – this secular worldview driven path – we who refuse to recant and repent of our open devotion to God as He has revealed Himself in His perfect Word will be persecuted more and more intensely. This persecution will build into the ultimate, final solution to “the fanatical, obsessed Christian problem”. Yes, this can happen in America…and it most certainly will, so long as we allow the Secular Inquisition to define our culture and fuel the fire of an increasingly antagonistic anti-Christian worldview. So it is all on us, Christians. In this most challenging time, God has given us all that we need for peace, joy, prosperity and victory: the Gospel and the Great Commission. Now the question for us is: What are we going to do?